The Sunset of HP Public Cloud Was Not Fully Unexpected to Us. This Article Explains Why HP Public Cloud Rightly Moved To HP Enterprise Cloud. Hewlett Packard Company had two divisions of their Cloud Computing Portfolio – Public Cloud and Enterprise Cloud. For future compatibility, we always write the guides as for HP Cloud. Like Zend Opcache Optimization for Nginx on HP Cloud. It was a confusing idea to run both the HP Enterprise Cloud and HP Public Cloud together. The support of HP Public Cloud as high as Backspace at fraction of cost. Infrastructure was managed but software level was unmanaged. Switching from unmanaged to managed without moving the infrastructure was an impractical idea. Most important feature of HP Public Cloud was the free virtual router and 100% whitelisted IPs. Ordinary noob users registered for HP Public Cloud and failed to simply SSH or open the ports of HP Public Cloud. HP Public Cloud, in real; was never HP Public Cloud but was HP Infrastructure Managed Virtual Private Cloud from functional point of view. We talked about Virtual Private Cloud before, basically Virtual Private Cloud is far better than all-open-port Public Cloud. Noobs disliked the idea of HP Infrastructure Managed Virtual Private Cloud. Some users blamed for less needed features, including absence of Reverse DNS. Honestly, we are missing the native HP Infrastructure Managed Virtual Private Cloud ( read HP Public Cloud ) at so low monthly cost. Akamai’s DNS, CDN all were great. It is not possible for this website to pay for HP Managed Virtual Private Cloud. There will be very few users like us in this condition – who knew to use HP’s resources at so lower cost but was at budget. Quality, possibly has lesser value than an undetermined factor. We will be missing HP Public Cloud but we will say that – Hewlett Packard Company did the right. It was a wastage of resources for Hewlett Packard Company. There were few users of DNS service from our calculation. Again, we know very well that, Quality possibly has lesser value than an undetermined factor with out this website. It is quite normal for HP to fell depressed with HP Public Cloud offer. HP Public Cloud Rightly Moved To HP Enterprise Cloud BUT You Will Move Your Web Application? If you can pay the cost of HP Managed Virtual Private Cloud, definitely you should towards HP Enterprise Cloud. The cost of HP Managed Virtual Private Cloud is not exactly huge, starting from approximately $170/month. It is not great option for us to pay more than $200/month fee for this website. The last option appears to be most cost effective to us. At this moment, we are at Option 2, but we will possibly move to Option 3. OVH uses OpenStack based infrastructure and quite bigger company. OVH is infamous for DDoS attack. It is better to use a server from Linode or DigitalOcean running Nginx as Reverse Proxy in front of the live instance if OVH cheaper Cloud Servers are used. CloudFlare ( paid ) basically serve the same purpose. There are tricks to use OVH’s low cost instances. Higher cost servers from OVH has no difference with the larger infrastructure providers. We do recommend to use HP Enterprise Cloud’s Virtual Private Cloud if the reader’s budget permits. At the same price, Rackspace is beautiful piece of crap. OVH is kind of replacement for HP to keep the budget down. OVH is quite bigger and reviews will be exactly like HP Public Cloud by the noob users. VPSDime is newer, so far we heard is not bad. European server providers are basically cheap. Not much to feel suspicious. Once you get used, with OVH dedicated hardware, its easy to join with HP Hybrid Cloud. Aruba Cloud is a Hewlett Packard Company! So, unofficially, HP Public Cloud exists via Aruba Cloud. 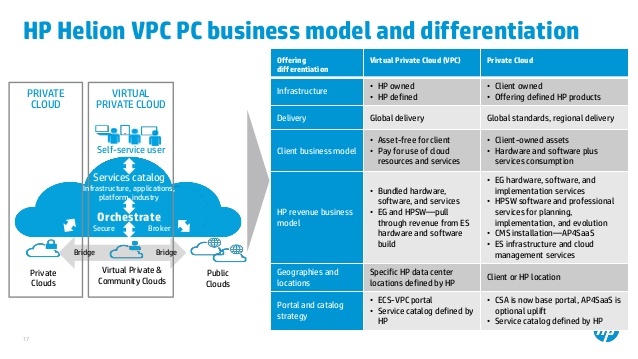 Cite this article as: Abhishek Ghosh, "HP Public Cloud Rightly Moved To HP Enterprise Cloud," in The Customize Windows, November 4, 2015, April 21, 2019, https://thecustomizewindows.com/2015/11/hp-public-cloud-rightly-moved-to-hp-enterprise-cloud/.